Home / Team / Congratulations Erin Flynn! 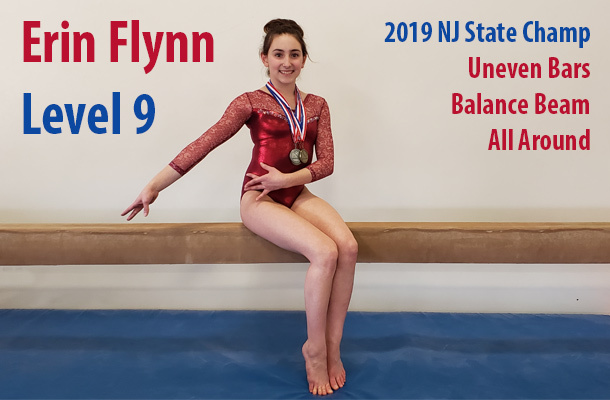 2019 NJ State Bar, Beam & All Around Champion! Erin is Will-Moor’s most decorated gymnast so far this 2019 season! We are proud to announce Erin won the gold on Uneven Bars with a score of 9.50. Gold on Balance Beam with a 9.175, Silver on Floor Exercise with a 9.275 and the coveted 1st place All Around Gold medal with an AA of 36.750. We are looking forward to seeing Erin compete at Regionals held in Virginia Beach in just a few weeks.